» Why Is My Ceiling Fan Running Slow? Why Is My Ceiling Fan Running Slow? The fact that a ceiling fan has little torque makes it susceptible to any problem which slows down its speed. In this article, we are going to look at the four issues that slow the speed of the ceiling fan and how they can be fixed. How to Troubleshoot a Slow Fan? 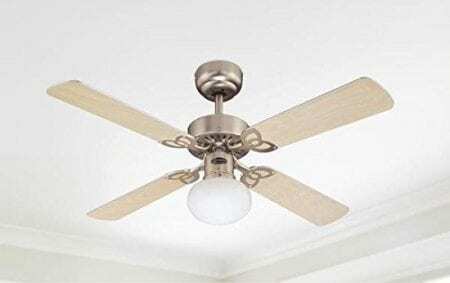 Since it is rare for a ceiling fan to have all of the four problems at once, you need to find out which one it is before you can look for a solution. As a precaution, any troubleshooting involving an electric device requires you to turn it off before doing anything else. After turning it off, try to manually spin the blade and see if it is difficult to turn. If the blade is difficult to turn, there are high chances that the problem is a loss of bearing lubrication. If that is not the case, switch it back on and listen carefully as the fan accelerates to full speed. If you sense some buzzing, grinding or squealing noise, then it means the problem is a shorted winding or a bad capacitor. It could also be an indication that the fan is running on the wrong type of speed control. If none of the above checks do reveal any problem, then you need to do visual troubleshooting. Observe the spinning fan to see if it is wobbling. If this is the case, it means that the fan is poorly balanced and this could cause a problem with its speed. Fixing the above issues is fairly easy as you can do it by yourself provided that you can follow the manufacturer’s instructions. For instance, if you have identified the problem to be lack of bearing lubrication, you can add more oil to the oil reservoir and everything will get back to normal. The type of oil used in ceiling fans for lubrication is usually SAE 15 or SAE 10 and adding it to the reservoir is as simple as following the guidelines of the manufacturer to the letter. Poorly balanced fan blades would cause a significant reduction of the fan’s speed. You can rectify this problem by simply measuring the distance between the tip of each blade and the ceiling. There should not be a difference or more than a quarter of an inch. Otherwise, the fan will be considered to be off balance. Other problems such as a defective capacitor and a damaged winging of the motor could be a bit challenging and you may need the services of a professional electrician to fix.